my friend munster: But If You Put The Hammer In An Elevator? But If You Put The Hammer In An Elevator? I've just realised that I somehow managed to completely space on posting this outfit! I wore it especially to see Age of Ultron when it first came out a month ago and it's since become one of my favourite coordinates. 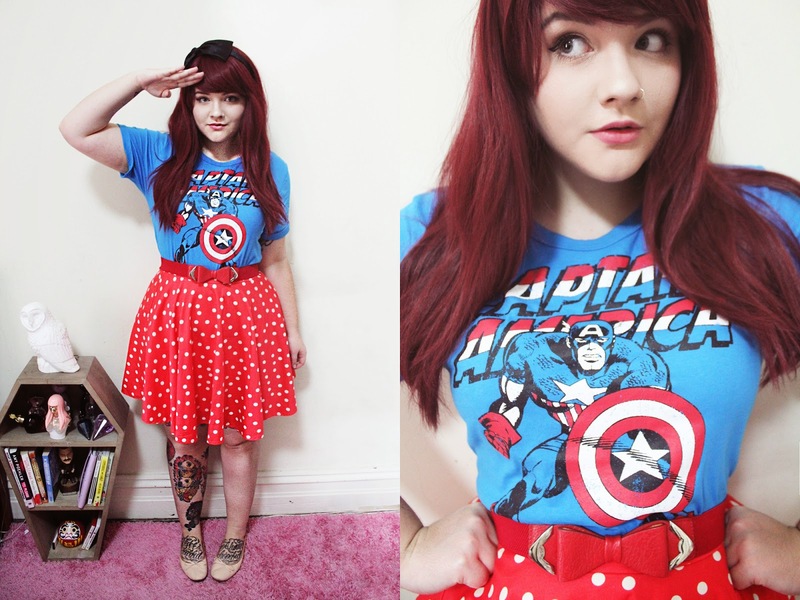 Captain America is easily my favourite hero, and I can't believe how difficult it was to find a shirt that only featured him that wasn't only sold online, let alone in a female friendly cut. As I was rifling through the mens and boys clothing sections (I ended up finding this one in the mens pyjamas section, and it came with matching shorts which is a bonus!) it really got me thinking about how adult women are limited when it comes to ~geeky~ apparel. As expected, the mens section is littered with typically masculine character merchandise - t-shirts, underwear, socks, even dressing gowns featured all kinds of pop culture icons from Mickey Mouse and Finn The Human, to The Hulk and Sons Of Anarchy, but in the women's section there were only a couple of shirts featuring either Minnie Mouse or Bettie Boop. It's almost as if, as adult women, we're expected to take no enjoyment from superheroes or fictional motorcycle gangs, which I find quite disappointing - why do we have to be the 'grown up' ones? Girls are just as likely to enjoy fantasy and fiction as boys, with 46.6% of comic readers and 48% of gamers identifying as female, so it seems very strange to me that this isn't reflected in what's available to us when it comes to clothing in stores that make all of this swag available to our male counterparts. But there is always hope online! With brands like Her Universe and Living Dead Clothing dropping some super jazzy pop culture designs, we don't have to be restricted to giant dudes t-shirts - just learn from my mistakes and remember to buy things before the day you want to wear them, lest you spend an hour frantically running around your local shopping centre hunting for a Captain America shirt. It is a bummer how sometimes women are blocked from circles. I did a quick search for Captain America on Target and technically they had more stuff for women than men, but the women stuff was more undies and socks than shirts. Which is a little weird, but I guess makes sense? I think if you are a fashion conscious fan, you will be more picky about which shirt you will buy, will it match other clothes I have? Do I like the design? Etc, while some guys will just say "I like this show, I'll get the shirt" and I know some girls who are just the same, but they don't mind picking up the guys shirt if a girls shirt isn't available.